Amtrak Acela Photo Gallery Page-1-;- Stan's RailPix Amtrak Page 11 of 14 !! Amtrak Photo Gallery : Page 11 of 14. -Click here for a first look at a New Amtrak Acela Express Train Set, at Penn Coach Yard in Philadelphia Pa. The train set will be unwrapped and set up for testing. 6/1/99. -Click here to see a top view of a New Amtrak Acela Express Train Set, at Penn Coach Yard in Philadelphia Pa. The train set has recently arrived, and is being set up for testing in the coach yard. 6/1/99. -Click here for a closer look at the Amtrak Acela Express Train Set coaches. Each train set will have 6 cars, and 2 HSEL (High-Speed Electric Locomotives). Penn Coach Yard, Phila. Pa. 6/9/99. 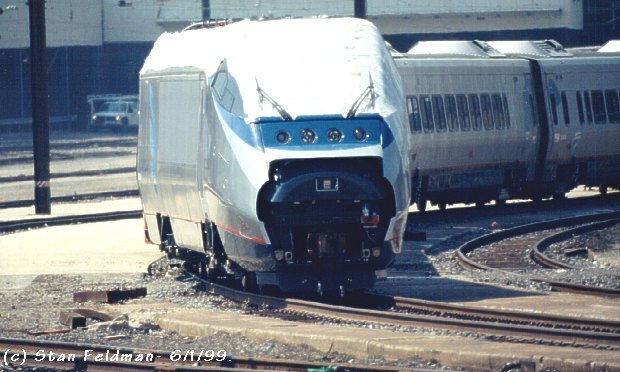 -Click here for a front "head on" look at Amtrak Acela HSEL (High-Speed Electric Locomotive) #2001, rated at 6250 H.P. 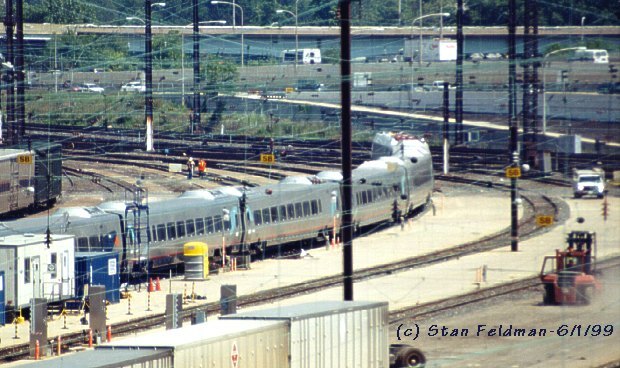 The power car will be testing systems and controls in Penn Coach Yard, Phila. Pa. 6/9/99. 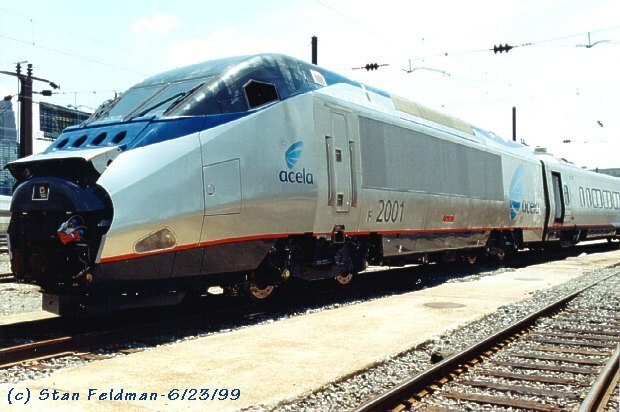 -Click here for a side view of Amtrak Acela HSEL (High-Speed Electric Locomotive) #2001, rated at 6250 H.P. The power car will be testing systems and controls. Each 6 car train set, has a power car at each end. Penn Coach Yard, Phila. Pa. 6/9/99. 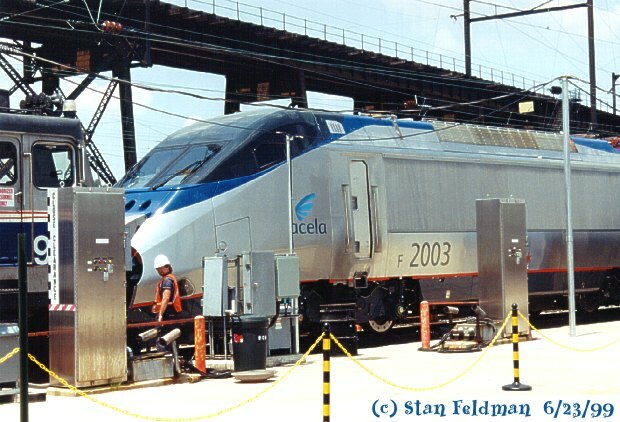 -Click here for a front 3/4 view of Amtrak Acela HSEL (High-Speed Electric Locomotive) #2001, rated at 6250 H.P. It is one of two power cars in each train set. Penn Coach Yard, Phila. Pa. 6/9/99. -Click here for a look at an "unwrapped" Amtrak Acela Express train set. Each 150 MPH six car train set, with a 6250 H.P. HSEL (High-Speed Electric Locomotive) at each end, will carry 300 passengers. Amtrak has ordered 20 train sets. Penn Coach Yard, Phila. Pa. 6/9/99. -Click here to see Amtrak Acela Acela HSEL (High-Speed Electric Locomotive) #2003, rated at 6250 H.P. It is being coupled to AEM-7 #948. 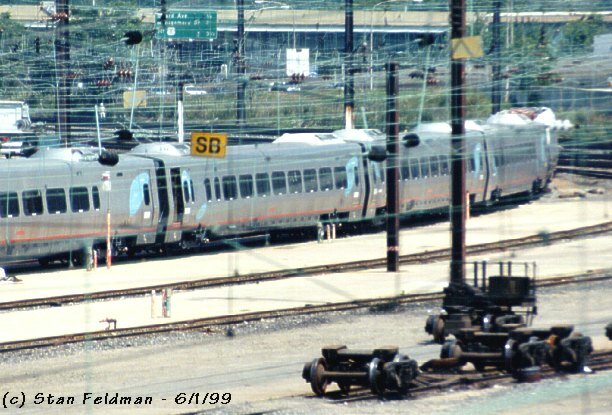 Penn Coach Yard, Philadelphia Pa. 6/23/99. 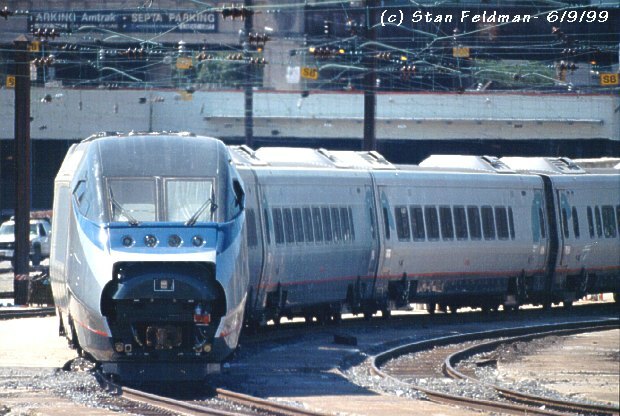 -Click here for a good close side view of Amtrak Acela HSEL (High-Speed Electric Locomotive) #2001, rated at 6250 H.P. 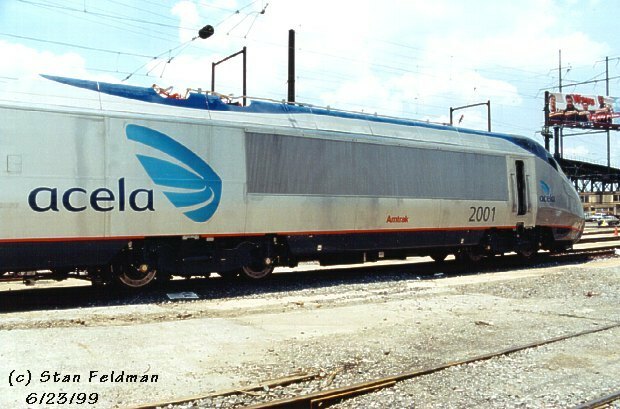 This shows the large Acela Logo, on the rear section of the HSEL (High-Speed Electric Locomotive). Penn Coach Yard, Phila. Pa. 6/23/99. 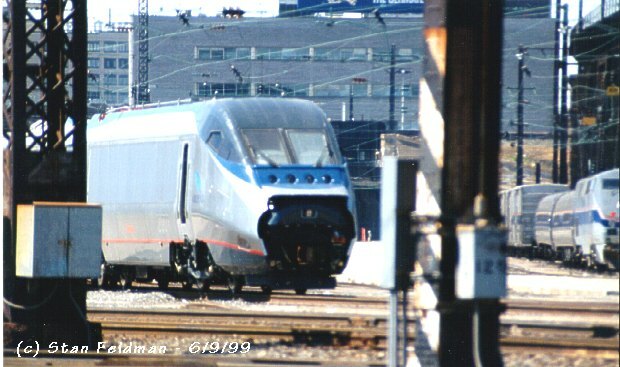 -Click here for close front 3/4 look at Amtrak Acela HSEL (High-Speed Electric Locomotive) #2001, rated at 6250 H.P. 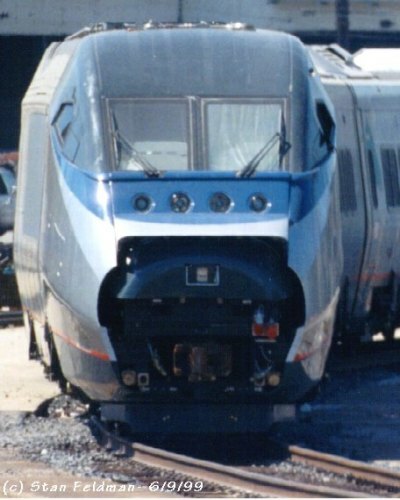 This shows the small Acela Logo, and various light, door and window details. Penn Coach Yard, Phila. Pa. 6/23/99. -Click here for an Amtrak Acela Express Video. Due to the size (2.34mb), this is a ZIP FILE and you will need have Netzip, PK-Zip, or Win Zip to open it. This video was shot and converted to an .avi file by Bob Shaffer. It was taken at Wissinoming station, Phila. Pa. on 4/8/00. It is a runby of the Acela Express Trainset with a blast on the horn. Click here to view the Amtrak Acela Express Video, as (1.53 mb) .mpg File. You can view this with Windows Media Player. Amtrak Acela Express Inaugural Run Slide Show !! 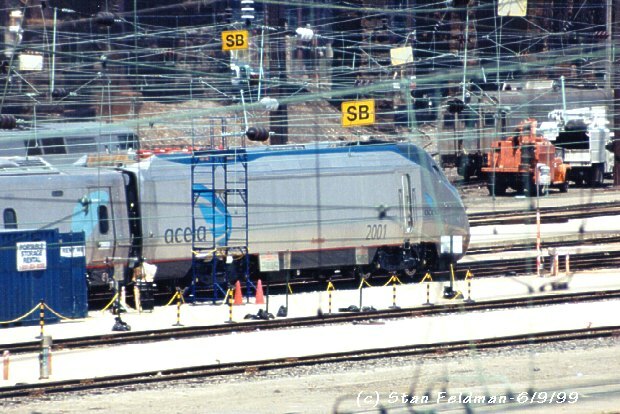 Click here to see images of Amtrak Acela Test trains in action ! TrainWeb "Inaugural Revenue Run" ACELA EXPRESS Coverage !